The twin gatherings of familiar faces and voices are meant to underline the theme of the campaign, “Book people unite.” The pro bono campaign is on behalf of Reading Is Fundamental, the nonprofit literacy organization founded in 1966. The campaign is being created by the New York office of Mother — appropriate in that the effort is aimed at mothers with children under the age of 15. Among the other agencies and companies involved are Curious Pictures, Jim Henson’s Creature Shop, Green Dot Films, the Mill and Search Party Music. The campaign is being supported by the Library of Congress and the Advertising Council, which coordinates the public service campaigns produced by Madison Avenue agencies. The campaign includes television and radio commercials, with a song written by the Roots, as well as print, online and outdoor ads. The TV version of the commercials is also appearing on YouTube. There will also be a microsite, or special Web site, which can be visited in addition to the Web site for Reading IsFundamental. The literary characters joining forces for the campaign come in two varieties. One variety is composed of original, one-of-a-kind creations like Babar, Black Beauty, Clifford the Big Red Dog, Curious George, Greg from “Diary of a Wimpy Kid,” Madeline, Peter Rabbit, Raggedy Ann, Raggedy Andy and the Very Hungry Caterpillar. This is the first time, those involved in the campaign say, that those characters have appeared together. Seven publishing companies cooperated to make that happen, including Abrams, Houghton Miffin Harcourt, Scholastic and Simon & Schuster. The other variety of characters in the campaign comes from long-ago novels or stories, among them Captain Ahab, Goldilocks, Humpty Dumpty, Little Red Riding Hood, Pinocchio, the Three Bears, the Three Little Pigs and Rip Van Winkle. The musicians joining forces for the campaign, who are heard in the commercials, include Carrie Brownstein of Wild Flag, Melanie Fiona, Jim James of My Morning Jacket, John Legend, Chris Martin of Coldplay, Nate Ruess of Fun. and actor-musicians like Jack Black and Jason Schwartzman. For example, a commercial for MetLife that appeared during Super Bowl XLVI in February brought together more than 50 cartoon and comic-book characters, joining the “Peanuts” gang that has long been featured in MetLife ads. And MasterCard has twice rounded up myriad animated characters for commercials. One spot featured cartoon mainstays like Fred Flintstone, Mr. Magoo and Olive Oyl and the other featured brand characters like Charlie the Tuna, the Jolly Green Giant, Mr. Peanut and the Pillsbury Doughboy. Reading Is Fundamental and Mother New York have been working together since the fall of 2010 on efforts that include a new logo for the organization. The genesis of the new campaign was a pair of partnerships: Reading Is Fundamental works with the Library of Congress, and the Library of Congress works with the Ad Council. That brought Reading Is Fundamental, and Mother New York, together with the Ad Council. The call to action, “Book lovers unite,” is aimed at those who believe “in the transformative power of books,” Ms. Benedict says. And the “unite” part of the theme is intended to remind people that “there’s strength in numbers,” she adds. The campaign urges bibliophiles to take five steps, Ms. Benedict says: Sign a pledge on the microsite, share the commercials with friends and family, donate money to Reading Is Fundamental, volunteer for community literacy organizations and advocate for the principles of the organization. The song by the Roots contains lyrics that celebrate how “one book can make a difference.” It is sung by the celebrated voices as the famous book characters appear on screen in real-life situations. For example, Madeline, Greg and Rip Van Winkle ride on a school bus, Humpty Dumpty pedals a bicycle, Raggedy Ann and Raggedy Andy ride the horse Black Beauty on a beach, the Three Blind Mice perform as a rock band and the Three Little Pigs sky-dive. So the campaign “brings the characters to life,” he adds, “the characters you remember as a child and the characters your child” is familiar with now. Mr. Graham recalls how “the Mother team, and Ernestine and her team, were on a whistle stop tour for quite a few months to visit the publishers” that own character rights. “It was astonishing,” he says, how eager they were to cooperate with one another to arrange for their disparate characters to appear together for the ads. Based on getting green lights for so many “celebrity characters,” Mr. Grossman says, “we thought, let’s put amazing voices behind each character,” and ask the many singers and actor-musicians to join forces for the song. The campaign also marks the first time that the Ad Council and Reading Is Fundamental have joined forces. The new campaign is “a great complement to the work we have out there now,” Ms. Conlon says, and she believes the new campaign will “get terrific media support” because “of the importance of the message, the quality of the ads” and how “uplifting” the campaign is. Those with long memories might recall some of the public service announcements — P.S.A.’s, in industry shorthand — that appeared on behalf of Reading Is Fundamental inthe 1970s and the 1980s. More recently, Reading Is Fundamental has been benefiting from the cause marketing efforts of the Macy’s unit of Macy’s Inc., which has raised almost $21 million for the organization since 2004. “People say, ‘I remember’ ” the vintage commercials, Ms. Benedict says, and she “can’t wait to hear someone say, ‘I saw that fabulous P.S.A.’ ” after the new campaign begins. Reading Is Fundamental and the Library of Congress are not alone on the literacy front lines. Other organizations like the American Library Association are also fighting to encourage reading and help children, as well as adults, develop and keep the reading habit. 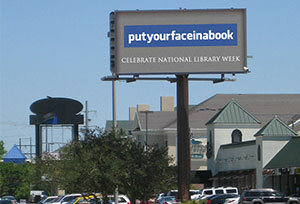 For the 2012 National Library Week, sponsored by the library association from April 8 to 14, the Lamar Advertising Company donated space on digital billboards around the country to run a public service campaign. The campaign was originally developed by Dave Olson of Lamar in Milwaukee for the Milwaukee Public Library. The signs borrowed the familiar logos of three powerhouses in social media to promote books. One sign, in the style of the Facebook logo, read, “Putyourfaceinabook.” A second sign, echoing Twitter, read: “One hundred forty characters? 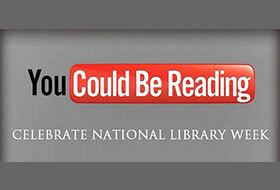 Try millions.” A third sign, in the logo style of YouTube, declared, “You Could Be Reading.”Lamar adapted the signs for national use by adding “Celebrate National Library Week” to the messages. The ads were to appear in 25 markets like Baton Rouge, La. ; Cedar Rapids, Iowa; Decatur, Ala.; Decatur, Ill.; Jackson, Miss. ; Terre Haute, Ind. ; Toledo, Ohio; Tulsa, Okla.; and York and Lancaster, Pa. The original article appeared on The New York Times' website. The ad campaign was developed by Lamar Advertising Co.’s Milwaukee office for the Milwaukee Public Library. Almost instantly, it went viral on the very social media sites it gently spoofs. The billboards are rotating all this week in 25 Lamar markets nationwide, including ours. 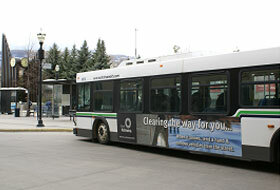 Commuters in the city of Kelowna, BC, will have more eye-catching ads to look at on buses for the next three years, thanks to a new advertising contract renewal.